Electric Toothbrush Reviews – Which Ones Really Work? Choosing an electric toothbrush might seem like a simple enough task, but there is more to consider about than you might think. The question is not whether your new brush is going to be better than brushing manually, the real question is are you buying the best electric toothbrush there is? You can read reviews, read the packaging, and even watch videos to see the brushes in action, but until you try it out on your own teeth, you won’t really know. We’re here to help you figure it out as much as possible. Do Dentists Really Recommend Them? It’s pretty obvious that electric is an upgrade from manual, but what do dentists say about them? The majority of dentists recommend them, although if you’ve had a lot of work done on your teeth, and have things like bridges, braces, fillings, and other enhancements, you’ll want to double check with your own dentist to see if going electric is a good idea for you. Most electric toothbrushes are safe to use with most dental work, but it’s always best to be safe. When you make the switch, it’s important not to put a lot of pressure on the brush while you’re brushing. Since the brush is doing most of the work, you’ll notice that you can use a feather touch while you hold the brush and it will still work just fine. 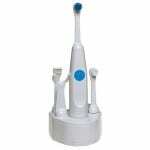 Many dentists have to remind their patients to brush more softly, and this holds true with electric brushes. There are even some models that will sound an alarm if you’re using too much pressure. That’s a great feature, and one you should consider if your dentist has told you to take it easy when you brush. We go into great detail on each of the following electric toothbrushes, but here we’ve got a recap of what you need to know about each one. It’s important to remember that no two mouths are the same, so your mileage may vary, and you should take into consideration your individual situation and apply that to the information provided here. 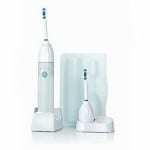 Sonicare has been around for quite some time now and gets stellar reviews from those that use it. The idea is that its vibrations create a sonic pulse that loosens the plaque from your teeth, allowing you to get whiter, cleaner teeth than conventional brushing, and even brushing with ordinary electric toothbrushes. Based on real world testing and reviews, the Sonicare line seems to stand above the rest in regards to performance, maintenance, and overall value for money. We gave it our Thumbs Up rating, and suggest choosing a model that falls into your happy place in regards to the price. You’re probably familiar with the Oral-B name because they are pretty much the only other toothbrush competitor giving Crest a run for its money. 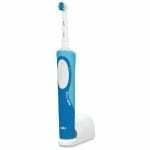 But aside from conventional toothbrushes, they also have a lock on the electric toothbrush market, and produce a wide range of models that will suit most any budget and feature request. They also have a sonic enabled model to give Sonicare something to think about. The best thing we liked about the Oral-B line was it’s extensive number of models. If you want whiter teeth, they have a model for that. If you want to get the harder to reach places, they have a model for that. It’s just a matter of choosing which one you like and going from there. The Cybersonic toothbrush is like the Little Engine That Could. It’s been chugging along for well over 10 years now and is essentially the same model and the same design. The enhancements to it have all been internal, and it claims to be the fastest electric toothbrush in the world, with RPMs of 45,000. The sound it makes even sounds sonic, and they say that it gets your teeth extremely clean. What’s good about this brand is that they have a lot of useful attachments, including a tongue scraper and a flossing head that uses disposable, pre-strong flossers. Very cool, and a way to keep your entire mouth clean. The Spinbrush used to be owned and marketed by Crest, but now it’s owned by Arm & Hammer. 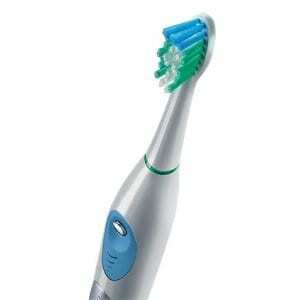 It’s the most basic of electric toothbrushes, and uses actual batteries in order to work. It’s real simple in design and function, doesn’t claim any sonic ability, and is essentially just a motorized toothbrush. The best benefit we found of the Spinbrush is that kids can use it pretty easily, the children’s version that is, and you don’t have to worry about them breaking an expensive piece of equipment. You can get a Spinbrush for less than $10 but watch out that the battery replacing doesn’t eat away at your wallet or pocketbook. 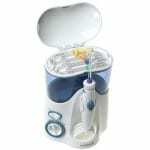 While technically not an electric toothbrush, the Waterpik Ultra Flosser has got to be one of the best oral hygiene products you’re not using. A lot of people know about Waterpik, but not everyone has one. But they should, because it’s a great way to get your gums and teeth super clean, without having to floss the old fashioned way. It shoots a stream of water through the cracks of your teeth, dislodging food and plaque and getting places where floss just can’t reach. Highly recommended by dentists, and by us. Great for things like gum disease and gingivitis. You might have noticed that an electric toothbrush is not as eco-friendly as a manual. A manual toothbrush just uses good ol’ human power. Most of the models out there are rechargeable, which is great because that means you are not chewing through batteries and adding spent batteries to the environment. Most people don’t recycle their batteries the right way, and end up throwing them in the trash. By being able to recharge your toothbrush again and again, it cuts down on waste. However, it still uses more electricity than conventional brushing obviously, so you have to make some concessions if you want to go green. There are some companies that address this concern, for example the latest models are now boasting that they use less energy than before, and Cybersonic has even released en Eco model which specifically addresses the eco-friendly concerns consumers might have. Here are our tips on choosing the best electric toothbrush from the plethora of models you have available. First, you want to make sure you go with a company you recognize as having been around for quite some time. While it might not be fair to the newcomers, you want a brush that has withstood the test of time, and has released new versions as the years have passed. Next, you’ll want to make sure that it has a rechargeable battery, as this will prevent you from having to replace them with ordinary brands like Duracell. After that it’s really a matter of personal preference. Do you want to go sonic, or do you want to stay at a more regular speed. The claim of sonic toothbrushes is that they create a vibration in your mouth that loosens otherwise stubborn plaque. They say that get your teeth cleaner than a non-sonic brush. In our experience they do a great job, but we’re not sure if this is just due to the higher RPMs they function at, or if there really is something to the sonic theory. Whatever produces results, right? You should also look for what is covered in the warranty, and how long the warranty is good for. Electronics have a way of breaking down, especially when used in such close proximity to water. You should find a brush that has a good plan in place in case something goes wrong. A one-year warranty is pretty standard, but some companies offer an extended warranty, and some even have a lifetime plan when certain conditions are met. No matter which brush you go with, you’re probably looking at spending less than $100. You’re going to get something that will last you at least a few years, and all of the models come with replacements heads that you can buy on the cheap. No matter which way you go, you can’t really get it wrong here. You’re going to get a quality electric toothbrush that’s going to be a marked improvement to your current oral care routine.